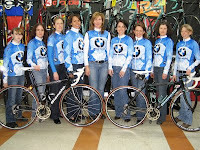 Last weekend I was booked to head south to North Carolina-for work-visit the BMW-Bianchi Elite Race Team. I had 3 frames to drop off for their season. In addition I was delivering a bike to be tested by John K of the Two Johns Podcast. Their first bike test indeed, yeah! Whilst down there (John loves 'whilst')I was to also getting to know the team, visit their supporting shop, sneak in a ride or two and cap off the weekend at a cyclocross race in College Park, MD. Phew! So I packed up the Element; 4 bikes, 3 frames, tool box, gear bag, various supplies in a bucket, and the Yakima Rocketbox was stuffed with the Corpo tent, camp chair, table, bike rack, and two workstands. Phew again! All that while netting 24 mpg on the hills of southern Virginia. Not bad for a car the shape of a toaster with a box on top. My first night was in Winston-Salem, NC. After a solid 9 hours of sleep(try and get that many hours at home when you have kids!) and a continental breakfast at the Days Inn, I departed for Charlotte, NC. I stopped at a super nice bike shop - Mock Orange Bicycles. If you're ever in Winston-Salem, visit these guys. Charles and Jay are two solid guys, sell Bianchi, and have merchandising skills to die for! The pictures don't do the store justice, you have to see it for yourself. I arrived at the final destination/meeting place for the team weekend. Christy has been my contact person through all of my interactions with the squad and has made me feel like one of the crew, thanks! A few more team riders showed up within the hour. 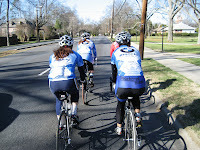 We donned our kits and jumped on our bikes for a tour through Charlotte. Christy on my left and a tree on her left. 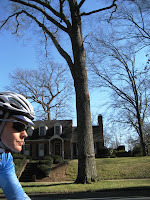 Blue bird day and in the high 40s as we pedaled along the training loop. 2009 team. Missing from the photo was Deb Whitmore, Cara Applegate, Laura Weislo who showed up later at the house. Thanks for the support ladies! Dinner time at Christy and John's house. 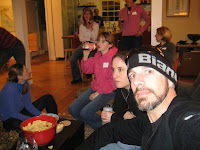 Notice the forward stares of the people in the background, 2007 Ghent-Wev was playing. Saturday John and I went mountain biking at the US National Whitewater Center. For some odd reason I thought I wouldn't be riding dirt this weekend, only road; no mtb shoes in the Element. Well, I had the itch for singletrack riding so I did what anyone in need of riding would do, used my road shoes. Yeah, road shoes which meant I installed my Speedplay road pedals on my SOK SRAM. This means it would be a 'No Dab Day' and every technical section had to be stomped with no looking back. This park has the best singletrack riding I've ever been on! There is a link off the park's homepage to a video of riding in the park and let me say that footage doesn't do the trails justice! The soil base is clay like and tacky in the corners. The trails flowed nicely but were technical in nature with mild root sections, whoops, drop offs, banked corners you could rail with the feet up and fingers off the brakes! Bam! John K is a fit man, I'll just say that. I'm not, right now, ugh! Aside from that, I would love to return there for more riding in the future. Thanks for the tour John! Later that afternoon after showering and packing up, I said farewell to John K and rolled out for Northern DC and it's CX race for Sunday.